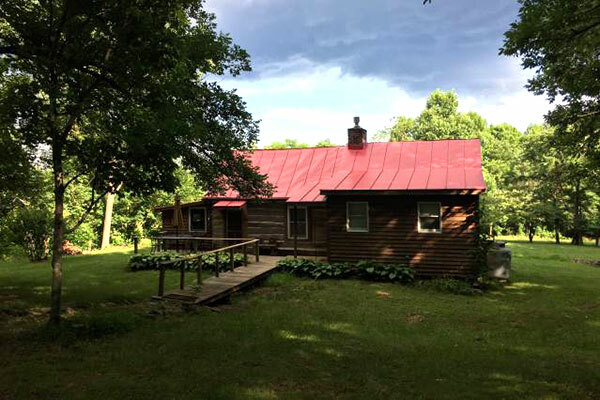 This is a cozy Cabin privately located in a green naturalistic meadow with nearby flowing creek surrounded by beautiful vegetation and trees. Part of the cabin was build in the 1815 as log house ( in amazing shape). Here you will find true peace of mind and space to rest away from your busy life and enjoy nature in a luxury accommodation. The Cabin was builded in the 1800, as a log house. Not long ago part of the building was add to the log house and the Cabin become more comfortable and bathroom and kitchen were on it. The side of the log house has an upper deck with one full king bed or two single twin beds ( as need). the lower part as living room with a sofa bed queen size, dresser, gas fireplace, 60 inch TV with amazon prime and Netflix available, comfortable chair to read a book or relax. Kitchen with all you need for cooking, new Delonghi espresso machine, mixer, toaster, water kettle, etc. nice big kitchen table. Cozy bathroom with washer and dryer, nice shower with 16 inch rain head. Outside nice porch with a garden table accessible from the living room or front door. Very nice deck covered and romantic wooden swing. Huge back yard with fire pit and two seats and party table and more. The king bed is located in the upper balcony and can be divided in two single twin beds. The balcony is over the living room. The sofa bed in the living room can be unfolded and folded as needed and is less comfortable that a real bed but still very good for sleeping. There is not strict (sound) privacy between the balcony bed and sofa bed as technically these are in the same space. Extra blankets available. The large flatscreen TV is in the living room and the sofa or sofa bed is a comfy place to watch it from.